My History was set up in 2003 by Tony Beardshaw to help beginners and experienced genealogists select and purchase Family Tree software at competitive prices. Our research showed that it was very difficult to find a selection of software or when several different packages were found in one store there were few staff if any, that had experience or could explain the workings of a particular program. Each software publisher will also give you a long list of what is good about their own program but of course they never tell you what it can't do. We felt that genealogy deserved better then this. At My History we do not produce any software ourselves so we are free to compare and recommend packages from any software publisher that we feel gives good value along with an appropriate program for your needs. 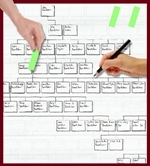 We hope that our comparison tables give a balanced view of any software available for genealogists. Soon after entering the genealogy market it became apparent that there were other products required by family historians to help them organise the documents and photographs that are amassed when taking on the responsibility of custodian of the family history. We now stock an extensive range of folders, binders, hold-alls, boxes and acid-free pockets for just about any combination of papers and photographs you may have. We also realised that many genealogists wish to give away printed copies of their work but feel frustrated with poor quality presentation letting down their years of research. 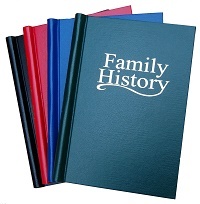 With this in mind My History has developed a range of book publishing solutions and a chart printing service that allows genealogists to present a family history in a format that grabs the attention of all members of the family including the younger generations. All these extensions to our range have meant four office and warehouse moves since My History started working from just a spare room. We are now based in a small warehouse and office block overlooking the Don & Dearne Valleys close to the historic town of Conisbrough a few miles from Doncaster and the A1 motorway. We take great pride in trying to hold stock of all the items in our range and our aim is to despatch all orders within 24 hours of receipt. My History is a UK based business that is owner managed and pays tax to the UK Goverment. It has no connection to any other organisation or owners outside the UK. We strive to recycle 100% of our waste. Currently 95% (by weight) of our waste (cardboard, paper, plastics, metals, compostable materials) is recycled. We are lucky to have a recycling plant next door that allows us to carry cardboard, paper and plastics around on foot thus reducing unnecessary road miles. Currently we produce just one black dusbin bag of rubbish per week that cannot be recycled. My History employs a small group of friendly staff that process and pack your orders. All members of staff are keen amateur genealogists who use the software and products we sell and are able to give telephone support should you get into difficulty with any of your purchases or just need advice before ordering. Tony Beardshaw - Sales, software support, marketing, systems support and owner. Sharon Hooley - Office Manager, Sales, software support, charts administration, purchasing and accounts. Stephen Buttle - Sales, software support, publishing specialist for charts and books. Dave Gillott - Shop sales, IT Support and exhibitions and Donside Manager. Lucy Smith - Warehouse Supervisor and assistant to Office Manager. Customers are welcome to call in and pick up orders. We have a small display area of the popular products we sell so that you may browse before you purchase. Our Shop is closed on Monday's and Tuesday's after a Bank Holiday due to the high volume of online orders needing our attention. Our offices for telephone sales and support are open between 9am and 5pm Mon - Fri . We are not open on weekends. We also attend various fairs around the UK and Ireland. Click here for a list of future venues. Customers who wish to pay using the PayPal system may do so, however we do charge a small surcharge for these payments due to the exhorbatant fees charged by PayPal.